Living with Logan: Delight Santa And The Kids With Wonder Forge! Delight Santa And The Kids With Wonder Forge! It's that time of year again.. letters to Santa, Black Friday, Cyber Monday, Small Business Saturday.... it all gets so confusing, when you're fighting complete strangers in public, on the floor, with your pajama pants sliding down and monstrous coffee breath, for the latest and greatest things all the little monsters in the world are begging for. For the Monster House, though, we are clinging to our family time. We've all but boycotted the iPad for anything that isn't educational, and we're going back to basics with Santa Claus. This is where Wonder Forge comes in, with quality games that are sure to please parents, kids, and Santa alike. I have to say... the checkbook won't be offended, either. Wait. What?! Fabulous games everyone will love without having to take out a second mortgage? Win/win! You just can't go wrong! We were delighted when the email came this year, asking us to review this season's newest games from Wonder Forge, so we could tell you how much we love them. I have to admit, though, we were right about to start (yet another) move, and everything was beginning to be packed and after I replied enthusiastically to the email, I thought to myself, "Am I NUTS?!" and then I reminded myself how much I love Wonder Forge, and I was fine again. So, let's get down to business! I have a house full of boys, and they were in heaven when the newest Wonder Forge box arrived. Absolute male bonding heaven. Didn't matter how old they are.... they were all hyper and ready to play. 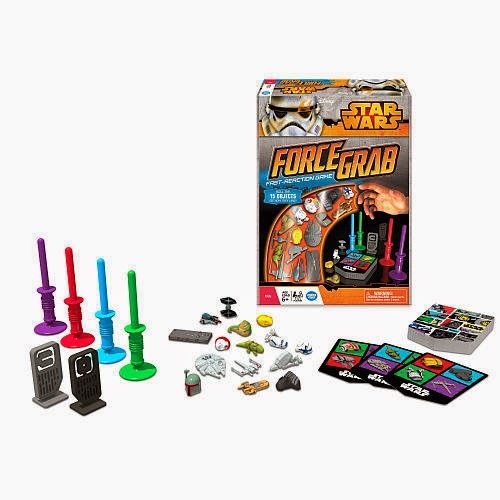 First up was the Star Wars Force Grab Game. And seriously... anything Star Wars in this house is instantly awesome. Available in stores and online at Toys R Us for $14.99, the price is sure to make parents smile. This is a matching game, where you match pictures of game pieces to the matching game card. Be quick! You have to be faster than your opponent, and the competition is fierce! This game is great for dexterity, memory, and reflexes, and teaches good sportsmanship as well. Suggested ages for this game are ages 8-14. I have to say, though.. this Momma is 40, the Daddy is 52, and we had a rockin' good time, just like our 9 year old. Because of the nature of this game, if younger players want to be included, it may be necessary to adjust the rules, or even toss out the rules entirely, focusing only on matching, to accommodate them. It was pretty cut throat at the Monster House, but it was all in good fun and no game pieces were harmed in the making of this review. If you loved Yahtzee as a kid, this next game is sure to please and bring back memories, while creating new ones with your child. 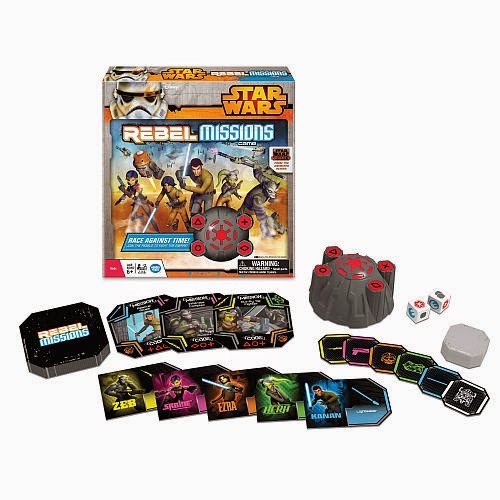 Star Wars Face Off Dice Game is recommended for children from 8-15 years, and is available for through Amazon for $9.99. 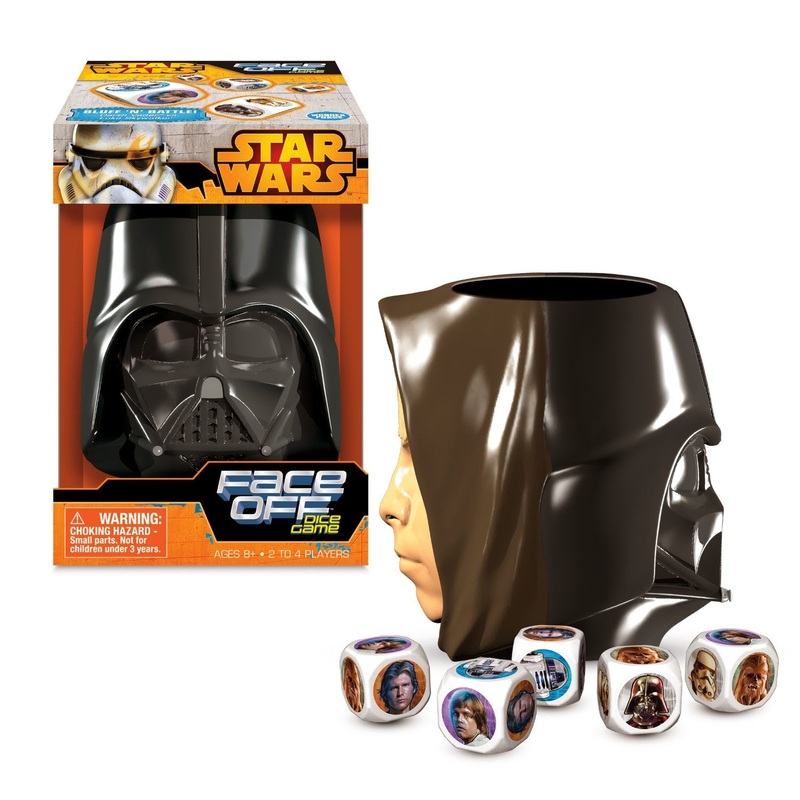 This game includes a dice cup with the face of Darth Vader on one side and the face of Luke Skywalker on the other. It comes with 5 game dice, a lid for the dice cup so it can be transported without losing game dice, and a copy of the rules. This is portable entertainment at it's best. You will need pen and paper to keep score, as you did with the other game I mentioned. But my monsters loved being able to be the hero or the villain, bluffing, and had a great time rolling the dice and getting points. Because of the small pieces of the game, this product is not recommended for smaller children age 3 and younger, and children on the younger end of the recommended age spectrum may need help from an adult to play. This game promotes strategic thinking and imaginative play. If Darth Vader and Luke Skywalker don't float your monsters' boat, but Spidey does.... check this out! The Marvel version of the Face Off game! Marvel Ultimate Spider-Man Face Off is also available on Amazon for $9.99, and recommended for children ages 8-15 years. 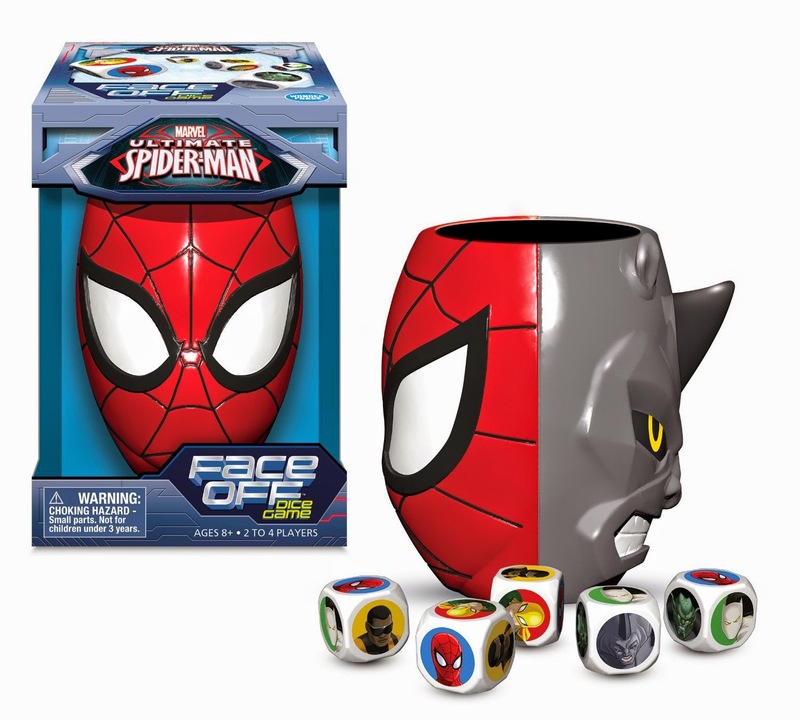 The dice cup has the face of Spider-Man on one side, and Rhino on the other, and includes cup lid, game dice, and rules. I can't help envisioning a rainy day at Summer camp, and some brilliant child yanking the Face Off games out of his pack, and suddenly turning into the hero of the tent. I'm funny that way.. vivid mental images. This game would also be wonderful for chasing away the winter storm doldrums that inevitably occur during Christmas break, forcing our monsters to stay inside. 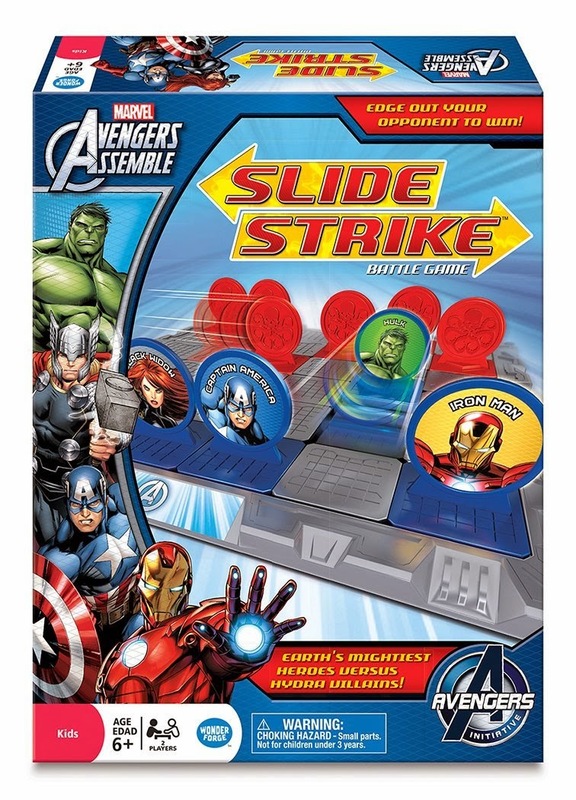 Lastly, we got to mess around with the Marvel Avengers Assemble Slide Strike Game. This game is available online at Amazon for $9.99, and is recommended for children ages 7-15. This game encourages strategic thinking and deductive reasoning, as players conceal their true identity and slide across the battlefield for surprise attacks. With each character combination, a different outcome to the game is possible. Whoever outlasts their opponent, wins! It just doesn't get much better than that. If you are looking to bring your family out of the screen time stupor just like we were, games the whole family can enjoy are the perfect solution. Wonder Forge has been a favorite of the Monster House for quite a while now, and their games have held up to moves, hysterical episodes of weeping and wailing when someone didn't win, and stealth trips to school in back packs for show and tell. The quality of the Wonder Forge product line is second to none, and sure to please both giver and recipient. So.. if you're looking for something special for the boys in your life that has nothing to do with screen time, you can't go wrong by choosing Wonder Forge. They are absolutely Monster House approved, with a rating of 18 thumbs up! I was provided with free product from Wonder Forge in exchange for honest opinions and reviews. I was not compensated monetarily for my opinion or review.